If you live in the United Kingdom or the Republic of Ireland, the publisher behind the Club Penguin Magazine is having a survey where you can win big time! The survey asks twenty or so questions about your player (how long you’ve been playing, if you’re a member, etc) and also questions about how much you like the content of Club Penguin’s magazine. I’m guessing it’s to gather some information from those who purchase the product to find out how it can be improved to be the very best. The survey is open until the 2nd of July of this year. 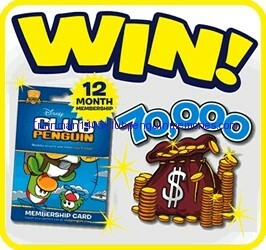 Five lucky penguins will win 70,000 coins on their penguin account and also a one year membership. The Club Penguin magazine first launched in February 2012. There are a total of 13 issues per year, or one every four weeks. Each magazine comes with its own special free item exclusive to that issue and also a code to unlock one of your choice from the treasure book! There are also 1,500 free coins per magazine issue (19,500 per year) and even free membership sometimes! If you’re looking to get the magazine mailed to your house rather than going to the store for it, you can subscribe to the magazine by direct debit for a fee of £15 every 6 months, and every 6th magazine issue is free of charge. You can subscribe online or call +44 (0)870 837 8504 and quote CP17. This is only available in the United Kingdom. If you live in another country such as the United States or Canada and want to buy the Club Penguin magazine, you can order it through subscription.co.uk or newsstand.co.uk. Please note that prices will be much higher due to overseas shipping! Hopefully one day the magazine will be found in stores here in North America! To take the survey mentioned, click here. This is ridiculous! Why do players in the UK get so much? Club Penguin originated in Canada, and yet it seems they get nothing! Same goes for the United States! US get all the films, games e.t.c out first exclusively before any other country! I know! Totally unfair and stupid! >:( CP only cares about the UK! Hey Train, is it possible to subscribe for the magazine even if you aren’t in the United Kingdom? Yes, instructions are given in the post. I entered since I got the mag. Fingers crossed! Then I guess you can’t take it. This is just a guess but is Graser older than you? And who played CP first? You or Graser? O_O $116.66 for a years worth of CP magazine… I think I will pass on that XD. I accidentally put the wrong link in the post, whoops. That’s not fair!!! I want to participate in that to! Why don’t they bring it to Canada. Ohhhh those UK people are sooo lucky. WHAT ABOUT VA!!!!???? D:< CURSE THE CP MAG! This sounds like an advertisement. Shame on you, Train. Shame on you. It wasn’t, some penguins legit want to know their options so I included that in. Will you still get the toys if you order the magazine off subscription.co.uk if you live in the USA? I just have s omething to say! So if we win this contest we will have a magazine for free but if you give your adress the person can come in your house and kill you!